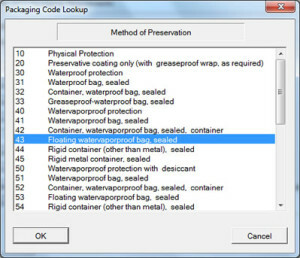 Comply/Pack2073 speeds the process of looking up Mil-Std 2073 packaging codes. It creates packaging worksheets by pulling the official language directly from Mil-Std-2073. Supplemental information may be entered for worksheets. Packaging may be stored by contract and line item. And since packaging codes are defined by DOD for each NSN, packaging codes need only be entered one time. After that you need simply confirm that it is the same for a specific contract. DIBBS electronic purchase EDI orders sent by DLA generally include Mil-Std-2073 packaging requirement codes. Comply/Shipper will store those for Comply/Pack2073 as it converts EDI POs into WAWF invoices, then use Pack2073 to automatically break down the packaging codes into a packaging worksheet. Take a tour of Pack-2073 software features (on our full site).